Can a writer ever have too many friends or get too much marketing advice? I'm giving this award to Market My Words, because I've been reading this blog for quite a while now, and Shelli always has unique words of wisdom on how to call attention to your book. She interviews editors, publicists, agents, publishers, marketers, and best-selling authors. All of them give tips on getting publicity for your book. Best of all, Shelli's part of a larger circle of friends that gave me my first writing gig, that introduced me to my fabulous crit group, that cheered me on when I made my first sales, and that is one of the best networks I know for children's writers--SCBWI, the Society of Children's Book Writers and Illustrators. 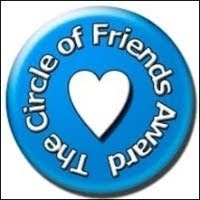 I'd like to share the Circle of Friends award with Caroline at Sunnybank Meanderings, who regularly uses her blog to promote other authors and their work, and makes it a point to comment regularly. She embodies the qualities Cate spoke of, and does so with a cheerful spirit. I hereby award The Susquehanna Writers the Circle of Friends Award. In the almost-two years I've been blogging, I've strived to visit other authors' blogs as often as possible. It’s been amazing to make such great friends, if only virtually. 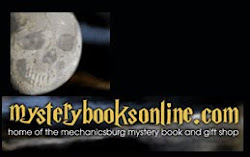 I encourage you to widen your Circle by visiting as many authors' blogs as you can. We are all terribly busy, and we certainly can't visit every one every day, but it's important to leave a comment to let them know their blogging isn't in vain, and that we appreciate their hard work. So it's up to the rest of you Susquehanna Writers - who do you want to pass along the award to, and widen our Circle of Friends? As a counselor, I'm always thrilled when someone publishes a book on a topic that's useful to kids, especially when it's written in an accessible style, and by someone whose work I admire. As an author, I'm downright depressed when that book is on the same topic as a book that I'm working on, and even worse, takes a similar approach. My stomach churns, my heart breaks. It's one of the very few times I feel competitive about writing. I know that sounds strange - in an economy that exacerbates the "so many manuscripts, so few homes" world of publishing, how can an author feel anything but competitive? But in my experience, writers are giving people, the very embodiment of the concept of paying it forward. If I succeed, I help you succeed, and that helps both of us to be successful. But can that happen when non-fiction writers are tackling the same topic? When I picked up the book in question, I could practically hear doors slamming. The very book that hadn't existed when I proposed mine now not only existed, it was good. Did that mean mine was now extraneous, irrelevant? I hope not. Time will tell. There are other publishers, other audiences, other possibilities.